When you are thinking of the best places for a vacation home, consider the extremely popular Folly Beach in Charleston. With a slice of heaven for everyone in your group, this area will not disappoint. The real estate market is quite reasonable as well with affordable vacation homes that can be used when you want and rented out on the demanding rental market when you are not. There is so much Folly Beach has to offer its lucky residence. Let's start with the award winning beaches. The soft sand and incredible Ocean surf make it desirable to families, couples, and especially surfers. You will find every size home on or near the beach for your specific needs and wants. Choose from high-end, custom finishes or a simple little beach cottage with everything you need. The market is quite varied and can offer just what you are looking for in a vacation home in or near Folly Beach. If being right on the beach isn't a priority, take a look around Charleston for a vacation home. The city is just a short drive from Folly Beach and was ranked number one city in the world by Travel & Leisure for 2016. The city has a perfect mix of historical charm, eclectic art, and incredible live entertainment. Find diverse restaurants for every palate and occasion. Find a laid back atmosphere no matter where you go or what you do. You will always find a friendly face and kind neighbor when you choose a house in Charleston. The other unique aspect of Folly Beach is the access to both the Folly River and the Ocean. If you decide you want to go fishing on the river or kayaking on the river rather than spend the day at the beach, you have the ability to do so. The area is full of recreational parks, astounding wildlife including the loggerhead turtles, and beautiful natural landscape. 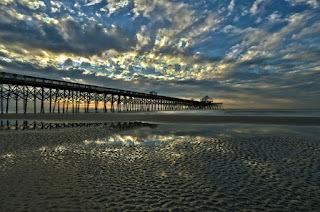 The famous pier is perfect for a fishing day or a just a better view from the top. With all of this, you will find a better quality of life when you find a vacation home near Folly Beach. Throughout the year, events pack the calendar for locals. On New Year's Eve, instead of a ball drop, Folly Beach does a flip flop drop. In February, there is a Folly Gras Parade, a mock off of Mardi Gras. March brings the annual Sea and Sand Festival featuring local talents such as crafters, musical groups, and of course, the best food in town. April brings the Palmetto 200 Relay as well as the Dancing-Moonlight Mixers. August brings the Surfer Governor's Cup, a district competition. September hosts Fishing Tournaments for the avid fisher. October is packed with the Folly Palooza, a Triathalon, and the Festival of Arts. November livens things up with the Jazz Festival and finally December has the Christmas Parade and Tree Lighting. So whether you are the type to vacation in the heat of the summer or escape the frigid temps in the winter, a vacation home in Folly Beach is the perfect place to retreat. And if all this information has sparked your interest in owning a vacation home in Folly Beach and you need a home management company consider Folly's Best Rentals. They are a locally owned and operated property management company that can help take care of your vacation home while you are not in the area.